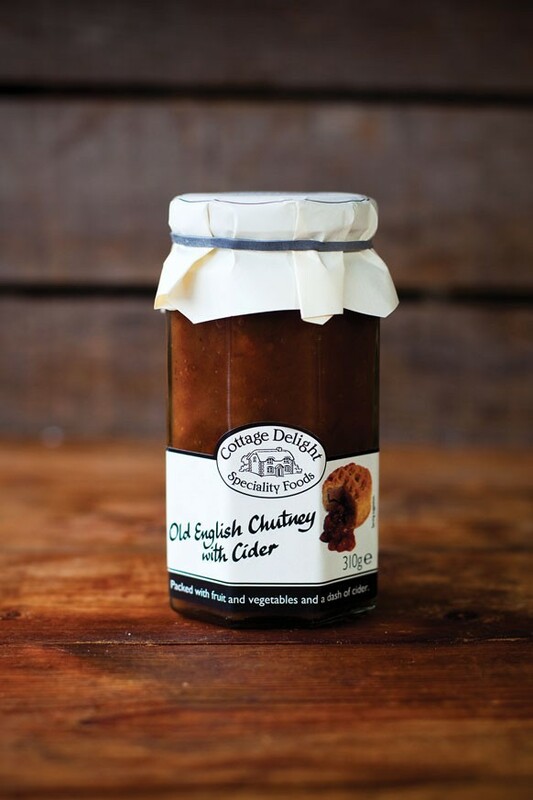 Cottage Delight Gold Taste Award Winner Old English Chutney with Cider is packed full of delicious English fruits and vegetables. Traditional made in small batch methods using Bramley apples, green beans, cauliflower, dates, onions and a dash of cider. Enjoy Old English Chutney with Cider as part of a classic ploughman’s platter of cheeses and cold cuts, or serve with hot sausage rolls and English pork pies. Use Old English Chutney with Cider to create the perfect luxury sandwich with a mature cheddar cheese, Cottage Delight Pickled Onions, and a glass of sparkling cider. INGREDIENTS: Bramley apple, demerara sugar, malt vinegar (from Barley), green beans, cauliflower, dates, dried onion flakes, raisins, cider (2%), gelling agent: pectin, salt, spices, garlic powder, Mustard flour.